Activity at a local bank in Dili, Timor-Leste. One key ingredient of inclusive growth is an financial system that ensures access to financial services for poor households. Access to finance enables the poor to protect themselves against adverse shocks and smooth their consumption, and thus achieve higher well-being. It also expands their human capital and productive opportunities, for example by financing education or the purchase of tools and equipment. In short, financial inclusion can be a strong tool for empowering the poor, augmenting their earning potential, and improving their quality of life. Creating an enabling environment for innovation in financial service delivery to increases access and lower costs of financial services. Implementing a proportional financial regulatory framework that advances synergies in financial inclusion, integrity, and stability. Integrating consumer protection and empowerment as a key pillar of financial inclusion. Gathering and measuring data on financial inclusion to inform decision-making. In Asia, 1.3 billion adults, or 46% of the adult population, have an account at a formal financial institution. The figure is higher than in Latin America at 39%, but much lower than 90% in high-income countries. There is a considerable variation among countries and subregions, closely correlating with per-capita incomes and level of development. A majority of people in the People’s Republic of China (PRC), Malaysia, Mongolia, Republic of Korea, Singapore, Sri Lanka, and Thailand have bank accounts. Yet in 17 out of 26 countries in the region for which data are available less than 40% of people have accounts. Of the 1.5 billion people in Asia without an account, 92% live in 7 countries: Bangladesh, the PRC, India, Indonesia, Pakistan, the Philippines, and Viet Nam. Share of population with an account at a formal financial institution, age 15 and over. Source: World Bank FINDEX, author calculations. While savings rates in Asian economies are high, a large portion of the population saves outside the financial system. Mobilizing savings through effective modern financial system can mobilize resources for inclusive growth. 32% of Asian adults report saving money – but only 21% of them save in financial institutions. The savings rate in Asia is higher than in Latin America (26%), but significantly there are about 300 million Asian adults saving outside financial institutions, representing about half of the total global population doing so. Patterns differ widely across countries, reflecting the level of both economic development and financial system maturity. 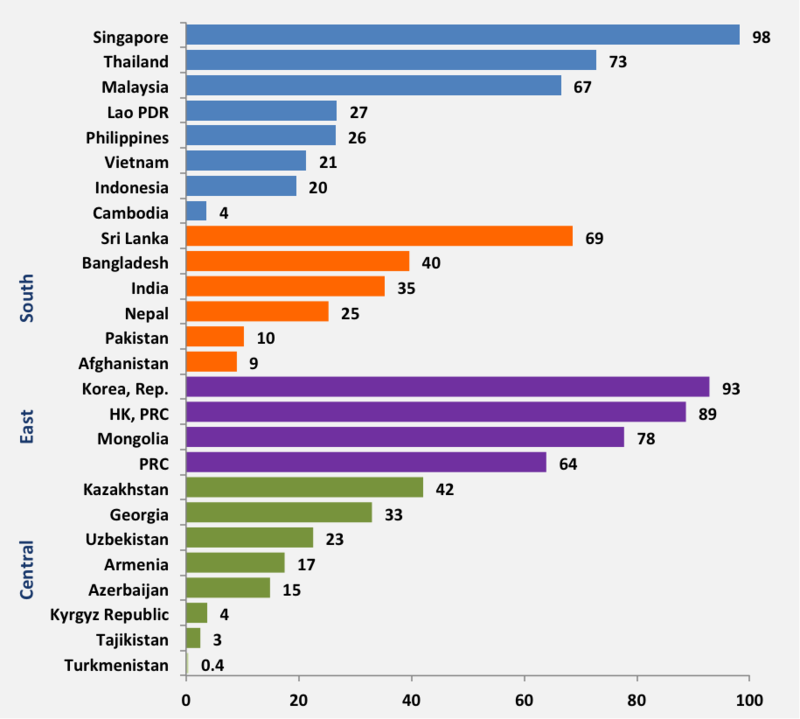 Percentage of adults saving in and outside formal institutions, selected developing Asian countries. Source: World Bank FINDEX, author calculations. In Asia, 38% of adults report borrowing, a figure lower than in other regions. In high-income countries, 83% of adults have taken a bank loan or have a credit card. In Latin America, the corresponding figure is 44%. Borrowers in Asia are more likely to rely on informal sources than in high-income countries. Among borrowers in high-income countries, 80% rely on formal sources, largely credit cards. In Asia, only 38% use financial institutions or credit cards to for borrow, compared to 60% in Latin America. Significant reliance on informal borrowing indicates potential unmet demand for credit products from formal financial institutions. Countries vary greatly in terms of an individual’s reliance on borrowing and on borrowing from financial institutions. If financial inclusion is to be more than just a statistic—e.g. the number of poor rural households that have an account in a bank or other formal financial institution—its beneficiaries must be able and willing to actually use finance for consumption and production purposes. An idle bank account does nothing to improve the welfare or expand the productive opportunities of the account holder. Furthermore, it imposes unnecessary additional costs on banks. So for finance to empower the poor, policy efforts must also carefully consider the this ‘last mile’ – not just broadening access to finance, but also inducing the actual, beneficial use of finance. Ways to do this include financial literacy and other financial education programs, encouraging banks and other institutions to design simple-to-use financial products for poor clients with little education, and the use of debit cards to facilitate conditional cash transfers to millions of poor rural women as has been done in Pakistan and the Philippines. Natalya Mylenko is Senior Financial Sector Specialist with the Finance & Markets Global Practice at the World Bank.